Under these increasingly demanding conditions, traditional engineering approaches that are structured around the creation, delivery, and evolution of individual products are no longer effective or even viable. These product-centric approaches result in exponential levels of engineering and manufacturing complexity, as well as create organizational and operational silos that can prevent companies from achieving key business goals. A new industry breakthrough has emerged to address these complexity challenges: the integration of product line engineering (PLE) and product lifecycle management (PLM). While PLM focuses on the engineering and management of mechanically-intensive systems, as well as key business operations such as ERP, manufacturing, sales, and beyond, PLE provides capabilities for managing product line variation across the engineering and operations lifecycle for an entire product line portfolio. By marrying these two technologies, companies can provide greater product line diversity through more variability in the product features they offer – while achieving economy of scale through the efficient sharing of hardware, systems, and software assets and better integration and alignment of tools, methods, and processes across the full systems engineering, manufacturing, and business operations lifecycle. More specifically, this approach introduces a new way of looking at the engineering and manufacturing process from a higher level of abstraction that is feature-based rather than part-based. Rather than use a Bill of Materials to determine the features that emerge in a product, companies can use a Bill of Features to determine the materials that are needed for a product, where materials can include mechanical assets, electronics, wiring, software, calibration data requirements, designs, test cases, documentation, and so forth. Additionally, PLE provides a “single source of feature truth” – a holistic view into the feature variations for a product family – which eliminates the need for multiple feature management mechanisms or tools. Under this approach, companies can establish a single, automated feature-based production system – much like a manufacturing factory – that uses product feature profiles to assemble and configure engineering assets from across the lifecycle to represent any of the products in a product line (Figure 1). 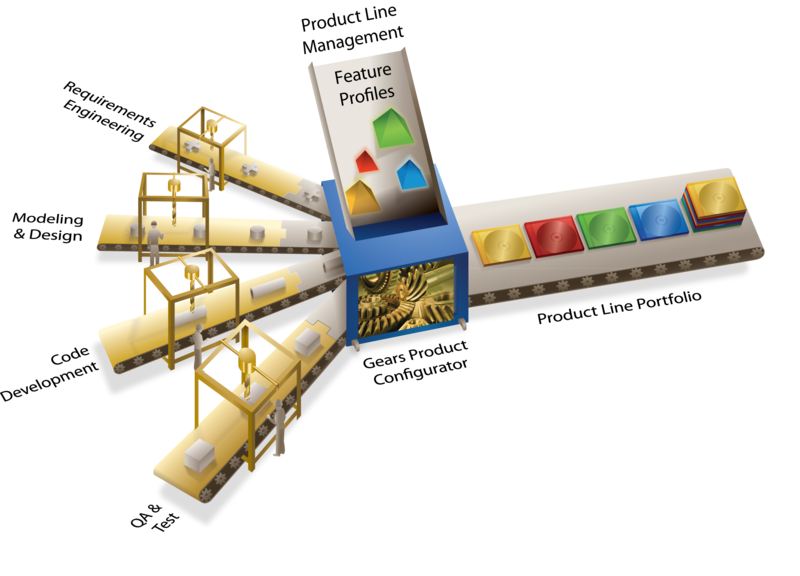 The same product feature profiles can also be applied to manage product variations beyond the engineering lifecycle in manufacturing and business operations. Leading-edge manufacturers in domains such as automotive and aerospace are adopting PLE to achieve new levels of engineering, manufacturing and operational efficiency, complexity reduction, time-to-market, cost avoidance, product line scalability, and competitive advantage. This new trend, known as product line engineering & operations (PLE&O), is enabling manufacturers to take advantage of the growing market demand for ever-increasing product sophistication and diversity by pushing the envelope with the most exciting and competitive new products in the market. Dr. Charles Krueger, BigLever founder and CEO, is an acknowledged thought leader in the PLE field with 25 years of experience in software engineering practice and more than 60 articles, columns, book chapters, conference keynotes, and session presentations. Dr. Krueger has proven expertise in leading product line development teams, and helping companies establish some of the industry’s most notable PLE practices. He received his PhD in computer science from Carnegie Mellon University.